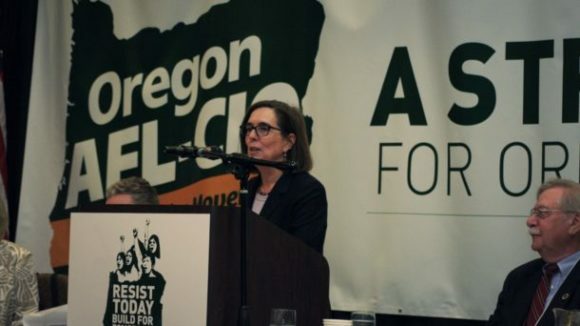 As a consequence of Big Labor’s compulsory dues-financed lobbying successes, states that give more special privileges to public-sector union officials have routinely burdened their citizens with more debt as well as heavier taxation. A recent report prepared for the Arlington, Va.-based Mercatus Center adds to the evidence that government union officials endowed with monopoly-bargaining and forced-dues privileges have routinely wielded them to jack up governments’ long-term and unfunded spending commitments. 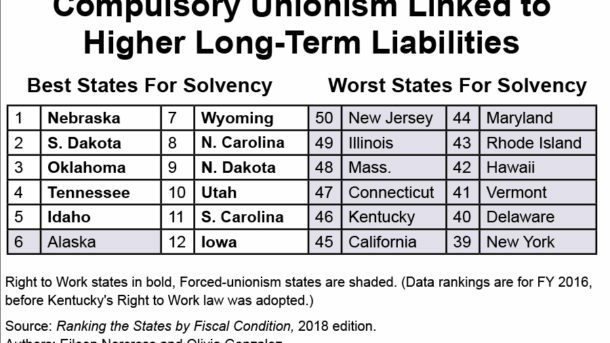 According to the Mercatus Center analysis, published last fall, all of the 12 bottom-ranking states for “long-run solvency” during the Fiscal Year 2016 (the most recent year for which the relevant data are available) were forced-unionism as of the end of FY 2016. But 11 of the 12 highest-ranking states for “long-run solvency” have long-standing Right to Work laws. A separate analysis released by the American Legislative Exchange Council (ALEC) at the end of 2017 found that, in the aggregate, unfunded liabilities of state-administered pension plans now exceed $6 trillion. And, as the Mercatus Center did, ALEC found there is a strong negative correlation between a state’s solvency and public policies authorizing the termination of employees for refusal to fork over forced union dues or fees to an unwanted union. States without a Right to Work law on the books in 2017 had an average unfunded per capita pension liability of $23,354. In contrast, the 27 states with Right to Work laws in effect had a large, but much more manageable, average per capita pension liability that was 40% lower. Expressed as a share of 2017 Gross Domestic Product by state, the average unfunded pension liability for forced-dues states was 34.5%, compared to an average of 26.2% for Right to Work states. “Obviously, Right to Work laws in themselves do not suffice to prevent politicians from making pension promises to government union officials that taxpayers can’t reasonably be expected to fulfill. “But they do evidently help keep politicians’ irresponsibility from getting totally out of hand. “The reason why isn’t hard to see. In jurisdictions where forced union dues and fees have been permitted and union monopoly bargaining in the public sector has been authorized for years, union bosses negotiate with government employers over civil servants’ pay, benefits and working conditions. “Meanwhile, for many years, government union chiefs have funneled a large portion of the compulsory dues and fees they collected into efforts to influence the outcomes of state and local elections. Because of union bosses’ extraordinary special privileges, politicians in forced-dues states have often preferred to cut core services and raise taxes again and again rather than stand up to Big Labor. Just last summer, the U.S. Supreme Court threw out a lifeline to fiscally troubled Big Labor stronghold states like New Jersey and Connecticut with its decision in Janus v. AFSCME Council 31. 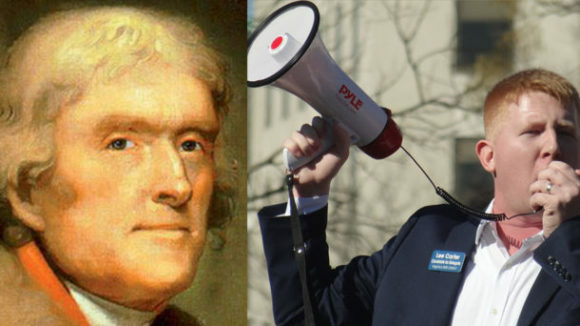 Ruling in favor of independent-minded Illinois civil servant Mark Janus in a case argued and won on his behalf by Right to Work staff attorney William Messenger, the High Court found that extracting forced fees for union advocacy from public employees as a job condition violates the First Amendment. This was primarily a victory for individual rights. 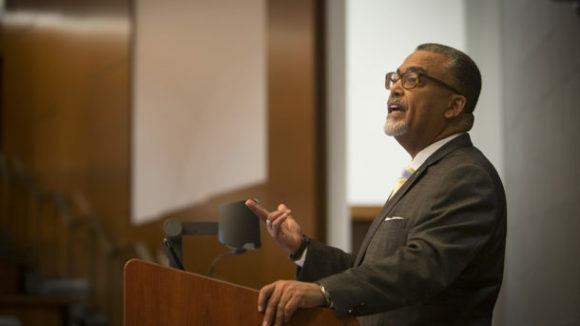 Its potential impact on state budgets is also vast. “Although actual implementation of Janus is going to require additional time and lots of determination, this landmark decision is already giving lawmakers in state after state an opportunity to reassert control over public pension obligations and protect taxpayers,” said Mr. Mourad.